When you scan in Professional Mode, Epson Scan automatically saves your scanned file in PDF format in your operating system's Documents or My Documents folder, or opens it in your scanning program. You can select settings, preview, and change the scanned file settings as necessary. Select the Document Type setting that matches your original, such as Reflective for documents or photos. Select the Document Source setting indicating where you placed your original. To scan a 2-sided document in the ADF, select ADF - Double-sided. Select the specific type of original you are scanning as the Auto Exposure Type setting: Document or Photo. Select the details of your original and how you want it scanned as the Image Type setting. Select any of the image adjustment settings you want to use. Before making adjustments, click the image or scan area in the Preview window. 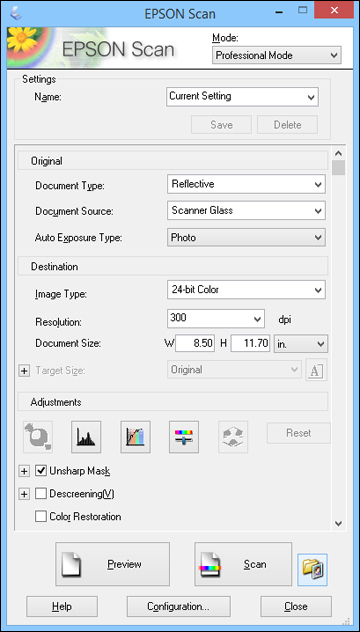 If you want to reduce or enlarge your image as you scan, select the Target Size setting you want to use.